Brainstorming — the term is common both in professional and educational contexts, and you’ve probably heard it countless times in your life. You probably also have a pretty good notion of what it’s all about — generating ideas, making decisions, and coming up with creative solutions for problems. But how exactly does a brainstorming session work? Which format works best, and which setting is the most effective, according to science? 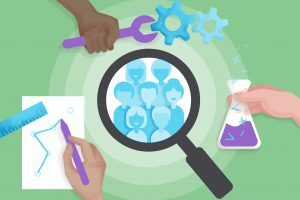 In this article, we’ll go over all these questions and try to show you the most effective way to brainstorm in a group setting. Brainstorming is a technique created to help groups generate creative ideas, with the aim to solve a particular problem. The term was popularized in 1953 by the advertising executive Alex Faickney Osborn, who predicted that the creative output of groups would be about 50% higher than that of individuals trying to come up with ideas on their own. Brainstorms can be used to generate ideas for all types of problems and projects, from finding the perfect name for your startup to solving a global energy crisis. However, each brainstorming session should focus on one particular problem. Go for quantity: Participants of a brainstorming session are encouraged to come up with as many ideas as possible. Don’t criticize: During the session, participants shouldn’t judge ideas, be it their own or others’ ideas. Welcome unusual ideas: Unusual and wild ideas are very much encouraged during a brainstorming session. Combine, refine, improve: Participants of the brainstorming should try to build on each other’s ideas. Contrary to Osborn’s grand claim, studies have never managed to prove the effectiveness of group brainstorms. 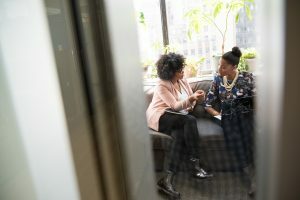 Depending on the complexity of the problem the group is trying to solve, many studies actually find that traditional in-person brainstorms often perform worse than the same number of people working independently. There are a number of reasons for this phenomenon, among them the so-called bystander effect, also known as social loathing. This is the tendency of people to make less of an effort if others are present. Social anxiety can play a big role, too, and affects particularly those members of the group who are shy, introverted or simply less experienced than other members. 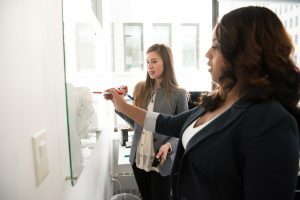 Additionally, individual members of the group can only express one idea at a time if they want the rest of the group to hear their suggestion. This drastically limits the number of ideas that can be generated within a given time frame. If brainstorming doesn’t work, then what should you do instead? 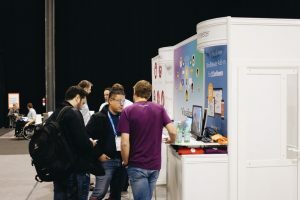 The solution to all of the typical problems associated with traditional brainstorms comes in the form of modern technology: Web-based collaboration software enables teams to brainstorm together in real time without having to be in the same room and physically interact with each other. Social anxiety is less of an issue when you’re facing your laptop screen instead of colleagues or superiors who may be judging your every word; the bystander effect is less effective when there are no actual bystanders; and the number of ideas that can be collected within a given timeframe is only limited by your typing speed. Compared to in-person brainstorms, online brainstorming sessions have been found to increase the creative output by almost 50% of a standard deviation. Online brainstorming sessions can be conducted with various types of collaborative software, such as Google Docs (for linear notes), online whiteboards (for randomly arranged keywords on a blank canvas) or sticky note tools (if you’re a die-hard fan of neon post-it notes). 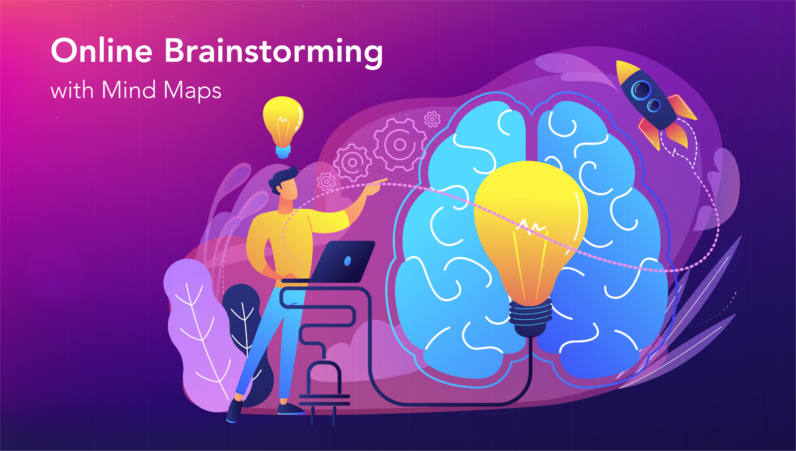 However, the most effective format to brainstorm, generate ideas and get your creative juices flowing is probably a mind map. 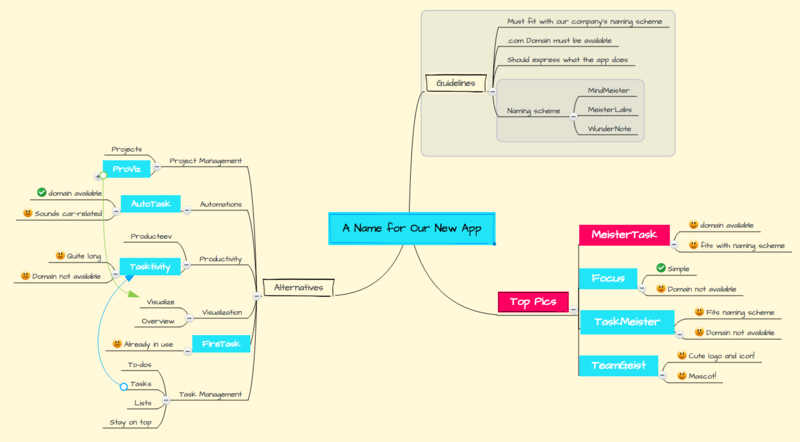 Mind maps provide structure and hierarchy for your ideas and offer a great overview. All your ideas are visualized on one single page. The mind map format reflects how the human brain works. New ideas can easily be generated through association. Mind maps make use of colors, icons and images. These can induce associations, emotions and connotations that can themselves spark new ideas. 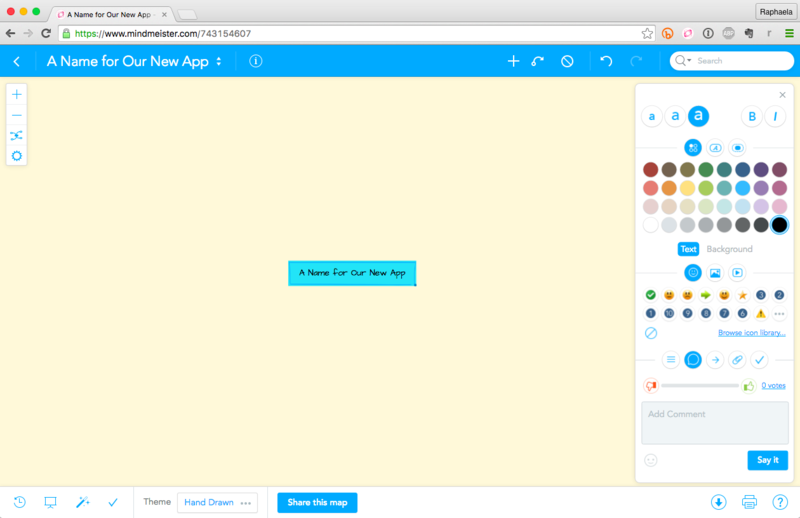 Mind maps let you add ideas anywhere on the map. You can insert them wherever they fit best, and group related ideas together easily. 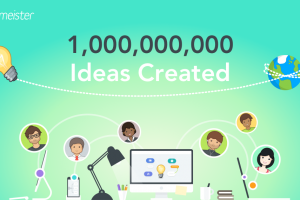 Mind mapping software like MindMeister supports online brainstorming sessions between an unlimited number of users, which means you can harvest the creative input of potentially dozens or hundreds of people. All changes are instantly visible in the mind map, so you can get inspired by other people’s suggestions and immediately build on them. 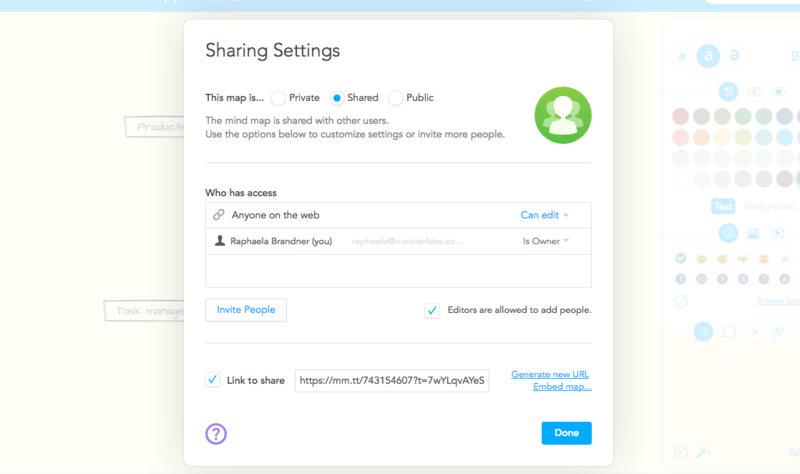 Sharing your map with others is easy — just invite them via email or send them a secure link on your preferred channel. You can even publish mind maps to the web and invite the whole internet to contribute. We call these maps “Wiki Maps“. 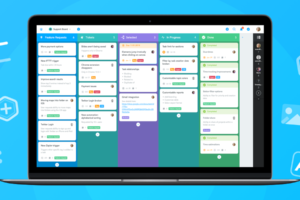 MindMeister allows for frictionless thought organization thanks to the incredible speed with which you can transcribe thoughts and ideas using key shortcuts. You can quickly paste links and images into your mind map, and store additional information for ideas in the form of notes without cluttering up the map. Using MindMeister you can comment on other people’s ideas and vote them up or down. The results of your vote can then be visualized at the click of a button. 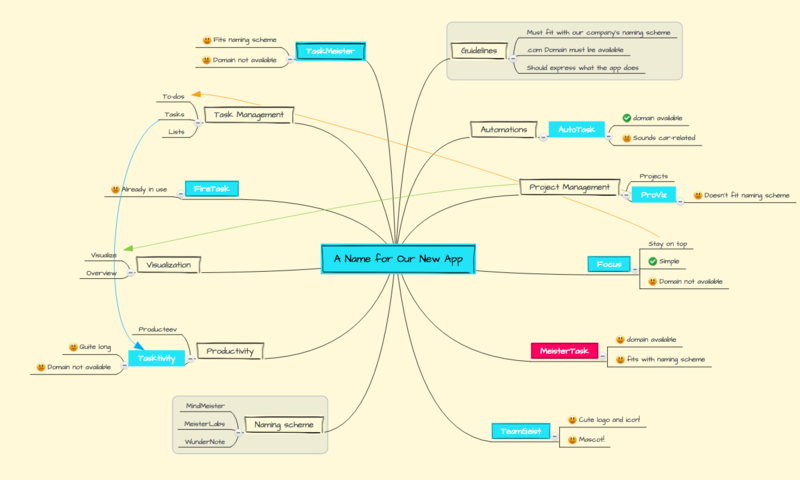 You can access the mind map anytime, anywhere, even from your mobile device. This way you can take part in the online brainstorming session whether you’re in your office chair, in the subway or in the park. Using MindMeister’s history mode you can track exactly who added what and when. Create a new, blank mind map in MindMeister and write the subject, problem or goal of your brainstorming session in the center. Add an image to the center topic if possible. Tip: Sometimes, formulating the subject as a question can help participants come up with ideas quicker. Write additional information about the exercise as well as guidelines for the online brainstorming session in the notes section of the center topic, so that everybody can quickly find out what’s going on and what they’re supposed to do. 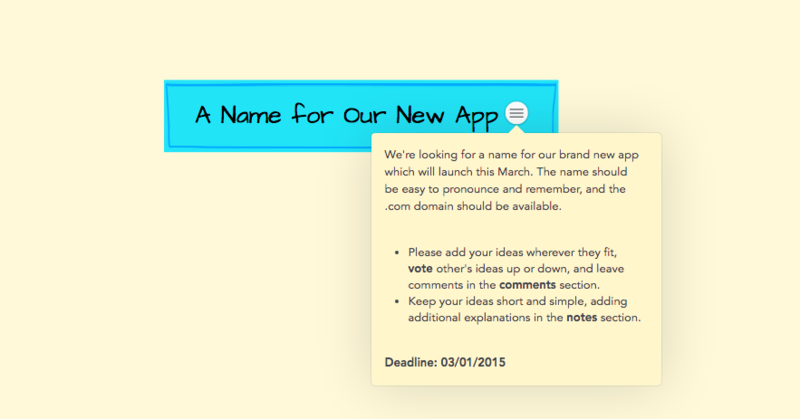 Tip: Provide a concrete deadline for people to add their ideas. This will ensure that the task doesn’t get put off indefinitely. Before you share your map with anybody else, add a few ideas yourself to help others get started and inspire them to add their own input. You can choose between inviting individuals via email, creating a secure link that you can paste into another channel (such as Slack, WhatsApp or a Facebook Group), or inviting whole groups of people at once. Once everybody has added their input, review the mind map carefully. If the map has become too cluttered, group related ideas and use colors to highlight the best ones. This will help you get a better overview of the material. Depending on the goal of your brainstorming session, you may end up with one single word as the result (e.g. when you’re brainstorming to find a great name for your new app), or you may end up with a number of action items (e.g. when you’re brainstorming strategies to reach new markets). If the latter is the case, ensure that all action items are turned into tasks and inserted into your team’s task management tool immediately. The last thing you want is for good ideas to rot away in a forgotten mind map.